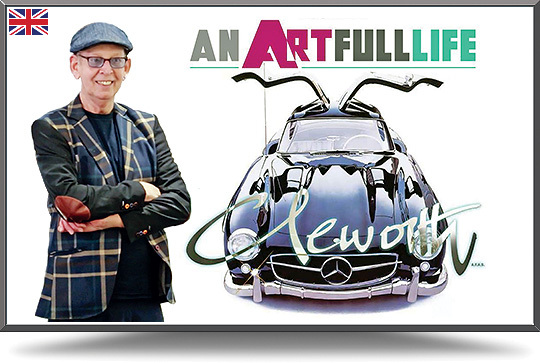 Harold James Cleworth is perhaps the most well known automotive artist working today. Born in the industrial North of England during the Second World War, he quickly developed a love for the aesthetics of machinery, and began painting the local Orwellian landscape. Several one-man shows were held in local pubs and libraries during his teenage years. Graduating from the prestigious Manchester College of Art in 1967, he moved to London to work for Decca Records, illustrating the first album covers for the Rolling Stones, The Who, and other new groups. In 1972, frustrated with the London scene, a trip to California convinced him to stay and begin his career as a fine artist, choosing the Automobile, his first love since childhood, as the subject. A series of posters followed, amongst them the black 300 SL gullwing Mercedes, which rapidly became the most popular automotive image on the market. The Chase Manhattan Bank of Zurich bought his first original, and private collectors began to commission him to paint portraits of their Bugattis, Duesenbergs, and Ferraris. Galleries invited him to exhibit in San Francisco, Santa Monica, Beverly Hills, and Carmel. The press discovered him, stories appeared in all the automotive journals, AutoWeek dubbed him the "painter laureate of the car", and the LA. Times ran his life story. Corporate commissions followed from Ford, Chevrolet, Saab, Isuzu, and Lincoln Mercury, all of whom desired portraits to introduce their new models. Posters were produced for the L.A. and Chicago Auto Shows, and the Newport Beach Concours d'Elegance, at which he was an honorary judge. Cleworth has firmly established himself as one of the world's leading 'auto-biographers', whose trademark of super-realism has become instantly recognizable, and whose forty-year dedication to the subject has proved enormously successful. Commission Harold to create a unique painting for you!